Sod grass is one of the main ways to create a lush, green, healthy lawn in a matter of hours. It is lawn grass that has already been matured on a farm, then harvested in patches a couple of inches thick. Sod provides a range of benefits, but problems are also encountered with lawn sod that seeding does not have, such as sod webworms and the wrong amount of sod. 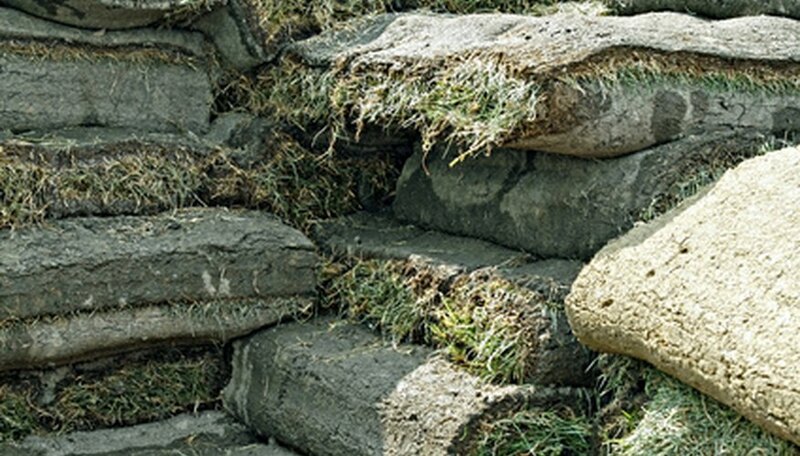 One of the most important steps of laying sod is to prepare the soil efficiently and correctly. If this doesn't happen, parts of the sod will turn brown or die, because roots won't establish, which happens quite often. Unprepared soil creates an uneven, unproductive environment for the sod roots to make contact and flourish. The soil must have all rocks, broken roots and weeds removed, and loosened up in the top two inches with a rake. After that, the soil must be raked over again to be evened out. The prepared soil grade needs to be approximately 4 inches below any driveways or walkways so the sod will be level. A couple months before you plant sod, test your soil to find out the pH so you can balance out the nutrients in the soil before you plant sod. Sod is expensive (more so than seeding), so it is important to order the correct amount before you begin. If you order too little, you will plant sod on your lawn than realize too late that you need more, thus ruining everything you've already worked on (the sod will dry out on the edges before you can add more). Ordering too much will be an expensive mistake. Measure your lawn area carefully where you will plant sod. Insects and grubs can kill a lawn quickly, and it happens most often in the summer. After sod is planted, sod webworms can invade quickly and easily. One way to recognize this is if your sod is having problems thriving or establishing roots, if brown circular patches pop up, or large finger sized holes appear in the top of the sod. If this happens, roll back the sod to see if you can notice grubs in the bottom of the carpet where they live and feed. The worms chew off the grass blades just above the thatch line, then pull the grass into their tunnels to be eaten. Another insect that is a problem with lawn sod is chinch bugs that appear when weather is excessively hot or dry. In this case, large brown spots spread quickly over the sod, and the bugs can be seen in these.